Before deciding on a motorcycle camping trip, there are always prerequisites, which, if not properly looked into, then you’d better not pursue the excursion. One of the camping essentials is a shelter system, and camping tents only make a fraction of the reams of options available in the market. However, at the end of it all, it’s you to decide on what conforms to your expedition. Nevertheless, the real question is “what’s the best motorcycle camping tent?” because you don’t want to go through the pain of not being able to set up a camping tent after a long day of enjoying your ride, or being distressed after spending hefty amounts on some of the contemporary camping equipment for just a few days of adventure, or choosing a heavy and huge tent which is throwing your bike off-balance while you’re riding. How to Decide which Motorcycle Camping Tent is best for you? The Harley-Davidson Roadhouse tent is designed through and through for motorcyclists. The tent sleeps 4 people and will shelter 1 motorcycle. Manufactured by a reputable name like Harley-Davidson, you know that the tent is high quality, and built to last. The tent measures 8′ x 7′ with a center height of 52″. The vestibule is 8’4″ x 8’7″ with a center height of 66″. The tent comes with a carrying bag and 14 aluminum stakes. While the vestibule is designed to provide shelter for 1 bike, users report being able to fit two comfortably, and 3 in a pinch. Riders also say that the poles are too long to fit in a stock saddleback when collapsed, and need to be strapped on the top. The Harley-Davidson Roadhouse tent is an excellent choice for any riding adventure and will provide plenty of room and keep you and your bike dry for years to come. The Vuz Moto waterproof motorcycle tent is a three season camping tent with separate garage space for your motorcycle. This tent is designed to allow you to go camping without worry about space. The tents large 18 feet x 8 feet footprint makes sure you have plenty of space for everything you may need or want to bring along. 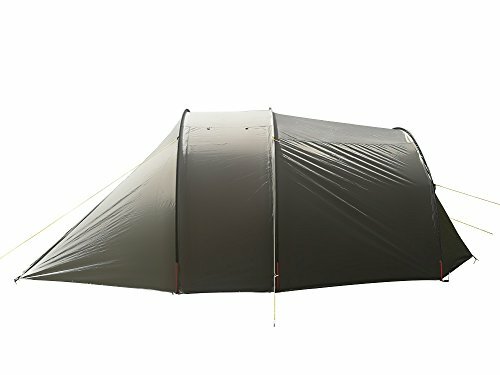 This tent has mesh on all its doors to provide ventilation while still keeping the bugs out. It has a simple set-up but is still easy to store. The combination of a waterproof rainfly and 10,000mm waterproofing on the tent floor makes sure you stay warm and dry in whatever conditions nature throws at you. The tent collapses to a pack size of 22.4 x 10.5 x 7.8 inches. It weighs 13.6 pounds. When assembled the sleeping area measures 9′ 6″ long and 8′ wide with a center height of 5’11”. The garage area is 110 inches, which will accommodate most all bikes. If you need a motorcycle camping tent and don’t want to sacrifice space, the Vuz Moto waterproof motorcycle tent is hard to beat. Keep all of your gear, your bike, and your friends warm and dry anywhere the road takes you. If you’ve been close to motorcycle campers, you’ve probably realized that most of them can’t really talk about “the best motorcycle camping tents” without mentioning the Redverz Atacama Expedition Motorcycle Tent. 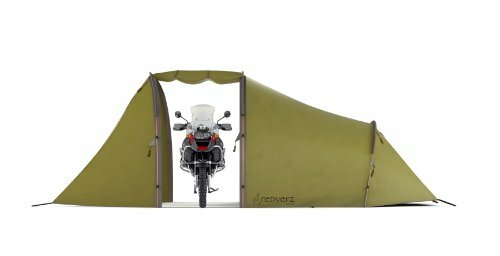 Designed specifically for motorcycle tourists not only looking for a premium shelter system but also protection and storage space for gears, the Redverz Atacama Expedition Motorcycle Tent is one of the versatile and satisfying tents that promises a pacifistic level of contentment never experienced before. Apart from the versatility and quality, this 3-person structure comes with 23-inches of sleeping room wide enough for both cots and sleeping bags. Also, the guys at Hillberg prides themselves on the uniqueness of their tents, and Hilleberg Staika 2 Person Tent is not left out thanks to the more sleeping space and separate camper doors which enable free movement in and out of the tent. For increased airflow, this new series of camping housing features a new mesh panel in the large porch door. Moreover, for total privacy, you can count on the opaque fabric door or vent with an open airflow and bug resistant mesh. This tent comes with 9-inch pegs undeniably designed to help overcome inclement weather conditions or difficult terrains which could make pitching a hassle, not to mention the easy to set-up poles and low profile pack size. Also available are two additional purpose-fitted ground sheets for either the sleeping area or the garage bay; this is ideal if your trip involves spending a lot of time in your tent. The sleeping area sheet significantly protects and prolongs your camping gears’ lifespan while the accurately-fitting garage cover not only reduces condensation but also keeps the tent tidy and organized. Admittedly, this a must-go-to tent that would make any motorcyclist’s camping experience unforgettable. Coated rip stop nylon fabric both for the rainfly and floor. Mesh panel on the huge vestibule entrance for increased airflow and protection from bugs. This tent is from the manufacturer TeePee Tent and is a three-season, 2 person tent designed for motorcycle riders to allow for storing your bike in its covered garage area and providing a sleeping area for two people. It also has a third section, a parlor, great for getting undressed and storing gear. This tent is made from waterproof polyester fabric and has an aluminum frame. It weighs 14.3 pounds and the sleeping room measures 86.6 inches x 96.5 inches with a center height is 70.9 inches. Pack size is 30 inches x 11 inches x 9.1 inches. The tent comes with steel stakes and guy ropes for stability. There are a total of 4 doors to allow for convenient entry and exit without having to crawl over other people or gear. This motorcycle camping tent is great for all of your adventures. It will keep you and your bike dry and provides plenty of room to keep your comfortable when you are off the road. After a long day riding on your motorcycle or when the rain starts pouring, the last thing you want to go through is to spend an hour setting up your tent. Lone Rider Mototent v2 is designed to save you the hassle; following the illustrations on the tent manual, you can actually set it up using the three color-coded poles which are easy to locate and insert. 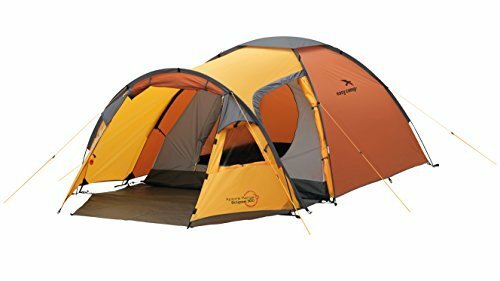 This tent comfortably sleeps two people, and the huge garage is adequate for a bike and camping gears. 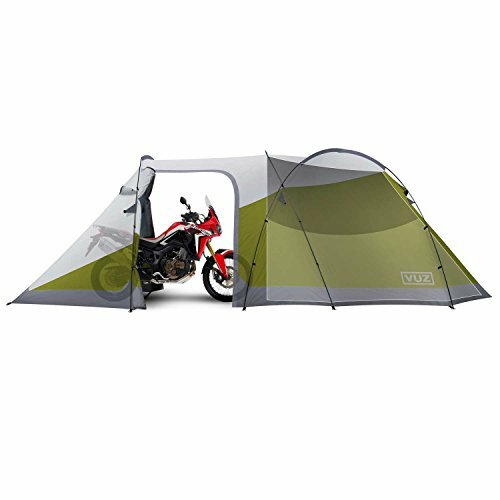 And if you are worried about porch-climbers, the tent features a motorcycle canopy which provides security keeping your motorbike out of site. Renowned for being one of the lightest motorcycle camping tents on the market, Lone Rider Mototent v2 tent weighs approximately 5.9kg and packs down to 50cm x 20cm x 20cm thus easy to assemble and carry on the trunk of your bike. As quick as it sets up, the Lone Rider Mototent v2 can also be broken down in under 9 minutes in any weather condition or terrain thanks to single side entry poles and preattached but removable inner tent. Evidently, this compact tent is convenient for adventure bike riders and touring motorcyclists. The quality of the parts of this tent clearly tells that it’s not poorly made. From the outer thick grade rip stop fabrics to aluminum pegs, to waterproof zips not to mention the thickness of the elasticated bands inside the tent poles – positive points that the tent can make your motorbike adventure memorable. In case you want to repair your motorcycle, the tent is designed to have a higher side than standard dome tents and can be used as a garage workshop. For more space, while working on your bike, the inner tent can be removed. Interestingly, customers pointed out that even if two bikes were parked in the vestibule, campers could still move in and out of the bedroom thanks to the rear door. Large vestibule and sleeping area allows for free movement, along with gear storage and a work space for your motorcycle. Aircraft Grade Aluminum poles and pegs which breaks down much quicker for easy storage. Waterproof zippers and thick grade UV resistant rip stop fabric keeps you dry even during a downpour. Vango has been on the market for quite some time, and their tents are admired by cyclists, award groups, and backpackers, and Vango Galaxy 200 is not an exception. In fact, it’s one of the lightweight and small pack size tent that perfectly suits motorcycle camping activities or people looking for extra space for their bike. 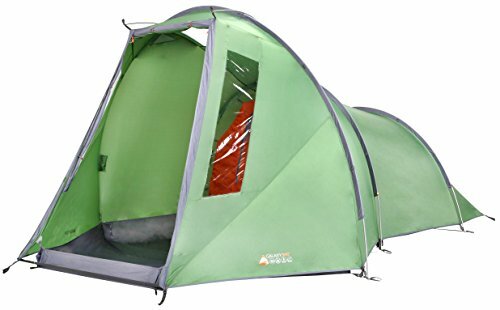 Being a tunnel style tent, Vango Galaxy 200 promises numerous features including color coded alloy poles which are easy to locate and insert, and reduce the weight of the tent not forgetting the patented tension band system which essentially increases the tent performance in adverse conditions exclusively in strong, changeable winds. Fascinatingly, the bands also support the poles at three points and prevent sideward movement when the tent is subjected to much tension. There is a combination of waterproof Protex HC polyester used on the outside material and breathable polyester flysheet on the inside with part-mesh door and Venturi Vent System both to allow for condensation to pass through and a comfortable night’s sleep at all times. Vango Galaxy 200 Tent was originally designed to meet the demands of outdoor enthusiasts, and since then, Vango has taken on board technology changes proposed by customers while retaining the proven shape and design. The tent offers the greatest space enough for two riders, and the clip-in riser porch groundsheet not only provides a clean, dry storage area but also reduces droughts. Small, light pack size and color coded poles which are easy to locate and insert. Rain stop flysheet doors, a design to stop rain drops into the tent when opened. Does your motorcycle camping involve four or more people? Then you’re in luck because Primus BiFrost H4 Tent sleeps up to six people. Considered to be the global model of Primus, this tent weighs approximately 9.3 kg and comes with an easy-to-follow assembly system. Mind you, these are factors that every motorcycle camper will be looking for in a tent because you don’t want a tent that’s either heavy or takes much of your time to assemble. This 3-season tent also promises extra resistance thanks to the aluminum arch supports which provide excellent stability. As if that’s not enough, the BiFrost H4 Tent features PU Coated Polyester flysheet and has a column water resistance of 3000 mm. What about the inner tent? Well, the good news is the inner tent is also waterproof – made of Oxford Polyester, and has a 3000 mm column water resistance ground sheet. In as much as ventilation and easy movement is concerned, this tent is thoughtfully designed with two sleeping rooms separated by a living room which motorbike campers can use as the garage. The tent’s standing height is admirable as you can walk in and out while standing. Other good news is that BiFrost H4 Tent also features ventilation openings and mosquito nettings that reduce condensation and keep mosquitoes away. To get the best experience, Primus has included storm guy lines, privacy windows, an easy to snap floor between the two sheds, and door raising poles for protection from rain. Nonetheless, the major shortcoming of the Primus BiFrost H4 Tent is its weight and set up time. Compared to motorcycle camping tents we’ve reviewed, this tent doesn’t promise much like the Lone Rider Mototent v2, or the Redverz Atacama Expedition Motorcycle Tent do. So, if you’re the kind of person who researches multiple products before purchasing one that suits your needs, you can check this one along with other tents on the market, but the two are still our best recommendations for lone riders or two person motorcycle adventure. Considerably lightweight (about 9.3 kg). Storm guy lines, privacy windows, and an easy to snap floor between the two sheds. Easy Camp has won the hearts on many outdoor enthusiasts as they design tents pertinent for any camper on a tight budget. Their tents are said to provide the perfect balance between quality, practicality, ease of use, and price. So, if you have every camping gear ready but missing a tent, Easy Camp is the solution; their tents quality is good, and the price is wallet-friendly. Even though Easy Camp provide a wide range of tents, Easy Camp Eclipse 300 Tent made it to our list of best motorcycle camping tents for various reasons. The tent accommodates three people, and its dome-shape design provides enough space and features appreciated on longer camping outings. Easy Camp Eclipse 300 Tent also features a third pole set away from the main tent which extends a tunnel storage area. In fact, this extension is why we recommend the tent for activities like motorcycle camping, or any other outdoor adventure where you’ll need extra space for your camping gears. For enhanced versatility, the tent features two entry doors not to mention the two windows and their accompanying vents which keep the porch area beaming and breezy. This tent is lightweight, easy to set-up and perfect for motorcycle campers looking for space in their trunk for any extra luxuries. Dome-shape with a third pole set away from the main tent to allow for an extension which can be used as a storage area. Two access door and two windows for free movement and ventilation. After reviewing our recommendation for the best motorcycle camping tents, you probably want to know the criteria we used in choosing these tent. Well, in a just few minutes, you’ll have a complete guide to choosing a tent that will meet all your motorcycle camping needs. But first, how do you prepare for a motorcycle camping adventure without breaking the bank? Or rather how do you plan for your forthcoming motorbike camping tour? To get the best out of your motorcycle camping trip, there are do’s and don’ts both novice and experienced campers should be knowledgeable about. Not many people might know where to start from or simply how to get started especially on their first adventures. Much contemplation should be put on how much you’re willing to spend on the tour. If you have the money to purchase all the camping equipment and gadgets, go ahead and do so. However, if you’re on a budget for that first trip, we recommend buying only what you need or even borrowing just to cut on the cost of the gears. If you have all the necessary equipment, try reducing your trip complexities by choosing a location familiar to you, traveling light, and endeavoring an area not too far from your home. Remember, the intention here is to develop skills and knowledge about motorcycle camping trips, and in case the experience goes badly, you can effortlessly find your way back home. You don’t want to reach your campground only to realize that some of the gears are missing. So, to avoid the trouble, keep all the gears in place before leaving home. Also, get familiar with the functionality of the tent and all the gears you’ll be using. A brilliant option is to assemble the tent on the yard as you try to figure out how different kinds of stuff work as well as if anything is missing. In as much as you might be aware of the convenience of carrying and packing exclusively what you need, you might be tempted to pack some extra cool camping gadgets. In that case, using a motorcycle camping checklist is important. 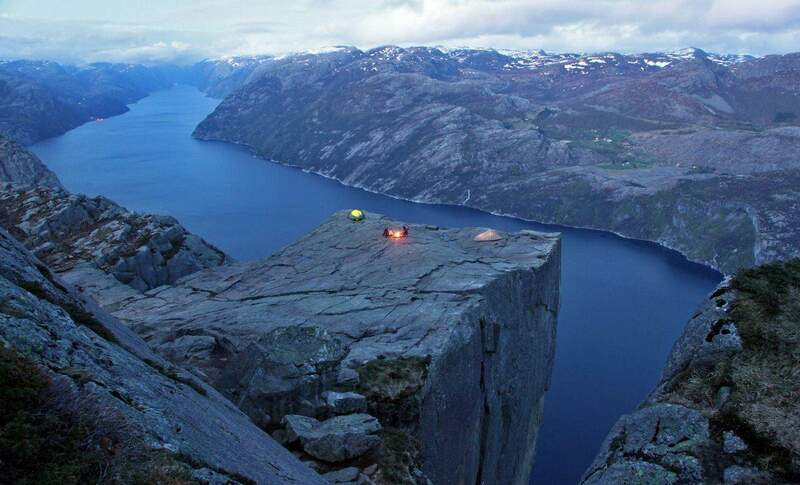 There are dozens of camping websites that offer checklists for any kind of adventure. Decide on a well-thought-out motorcycle camping checklist that highlights only the basic stuff. For instance, you don’t want to use a checklist that features a laptop as a must-have accessory. At the same time, it’s essential to jot down or take note of important things you needed but didn’t carry, or things you packed that weren’t necessary. Have you done a research on your campground? If not, you’re disregarding an essential part of planning for your motorcycle camping tour. Inquiring and exploring your camping location helps you decide if it’s the best place to tour. Get acquainted with the terrain, regulations, operations and generally what to expect at the time of your stay. Furthermore, find out if they’ve campsite amenities like toilets and showers, and don’t forget to ask if the campground is pest-free. Some campsites in the USA offer some activities, so, ask if they might be offering any motorcycle events or rallies. Where and in what season you camp has a lot to do with the tent you choose. For snowy or windy areas, pick a tent that will not only keep you warm but also has the strength and stability to resist the weight of the snow or fierce wind. On the other hand, a 2-season tent is the best choice if you’ll be camping in the summer or in dry/warm environments. But in rainy or wet seasons, it’s important you choose a tent that will keep you warm and offer a balance of strength and ventilation. Will you be accompanied by a friend during your motorcycle camping adventure? If so, then you might consider a 2-person tent. However, if you have a large group, your friends can carry their own tents, or you can choose one huge tent that would accommodate the group. Moreover, you might also want to consider an extra space for your gears or pet, in case you have one. Remember, there are no existing industry standards that define per-person tent dimension – and that’s why you need to try out the tent prior to your trip. How would like to operate while in the tent? How many doors do you prefer? If you’re tall or short, what should be the length of your tent floor? How much time does it take to pitch your preferred tent? Is it freestanding or non-freestanding? What type of rainfly do you want? Is it a roof-only rainfly or a full-coverage rainfly? What is the tent’s fabric? These are some of the questions you must ask the tent marketer before your purchase. And by the way, since you’ll be travelling by motorcycle, don’t forget about storage area/garage/vestibules. Also ask about ventilation – does your tent have large or small mesh panels. What about the weight and packing? Is the tent easy to fold? Is it heavy? Can it be backpacked in your motorcycle? Always ask as many questions not only to fulfil your conscience but to find a tent that fits your needs. No matter how much money you’re willing to spend buying your motorcycle camping tent together with other camping accessories that come with it, price always plays as a factor. That said, before you decide to buy what you might consider as your dream camping tent, think about your needs. While most tent providers promise durability, sustainability and other positive features, do research on the market, use trusted tent provider and principally buy something you can afford. When looking for the best motorcycle camping tents for your trip, it’s not enough that you consider the most popular brands or the modern camping equipment. As there are different camping equipment suited for various occasion, you have to be adamant about your camping needs. If by any chance you bought a tent that doesn’t offer the results you’d have expected or made your experience worst, don’t hesitate to change the tent. There is always a better brand or a better option that would sufficiently meet your camping need. Because we know how daunting it can be to purchase the wrong tent or to report a bad camping experience because of your tent, this guide is created to help you find the perfect fit. Remember purchase price is just one piece of owning a camping tent; be sure to consider all of the costs associated with your camping adventure.